Kingston upon Thames offers riverside living and beautiful market towns. Rentify can help you make the most of your letting with our handy borough guide. At Rentify we have property specialists dedicated to Kingston upon Thames, armed with local expertise and unmatched valuation knowledge to find you the right tenants. The Royal Borough of Kingston upon Thames has one of the smallest populations in London. Yet the borough is becoming increasingly popular with families and young professionals seeking a quieter suburban life and more space. The pretty market town of Kingston has one of the biggest retail areas outside central London and draws shoppers trying to avoid the bustle of Oxford Street. Its situation on the river Thames makes it an ideal place to spend a day exploring its riverside pubs and cafes. There is also a lot of diversity to be had, with one of the largest Korean communities in the UK calling New Malden home. Locals are fortunate to be on the border of Richmond Park which provides lots of green space and wildlife. While Kingston upon Thames has no tube lines running through it, there are plenty of National Rail services offering easy access to central London. Kingston upon Thames offers much more in the way of semi detached, detached and terraced housing compared with other London boroughs, which are great for families. Yet there are still plenty of flats available for single professionals and couples seeking a quieter life. Kingston upon Thames's many districts each have their own character, catering to a variety of residents. Here's our top picks for new landlords in the area. 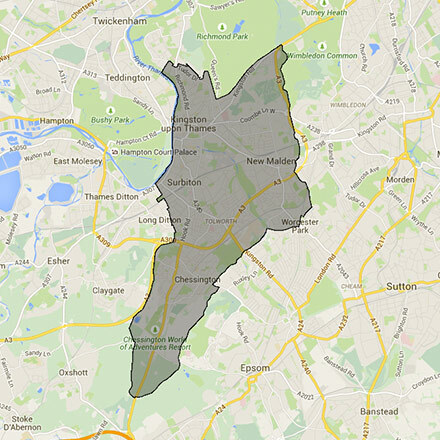 This borough covers the KT1, KT2, KT3, KT4, KT5, KT6, KT9, SW15 and TW10 postcodes. Rentify uses proprietary methodology for data collection and processing. Borough data is collected from Rentify's property database and external public sources.